Issue #31 is going to be a special theme issue — Dark Fairy Tales. For this special issue Niteblade is looking for fairy tales, and not just any kind of fairy tales, we want them dark — Grimms’ grimmest. Surprise us with the shadows of “happily ever after.” What price did the princess pay for her royal marriage? What beauty might be born from curses? What if the witches and evil fairies had the right idea all along? As always we’ll be looking for stories and poems that offer us something new and unusual so even though we’ll accept retellings we preference will be given to original fairy tales. Submissions are open now and we’ll be responding to them as they come in (not asking you to wait until after the deadline has passed). Please read and follow the submission guidelines found here. Thanks to you our 2014 fundraiser was a success! We raised $510 which will all go directly to paying our writers and artist. Thank you, thank you, thank you! 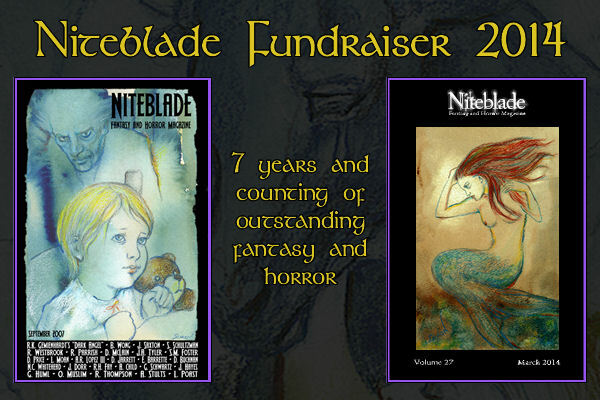 Over the next couple weeks I will be busy getting in touch with each donor about their perks and sorting out all that fun stuff, and then we’ll dive right into producing the June issue of Niteblade (which is going to be awesome!). Thank you again for all your support, you are amazing!